(Nanowerk News) Astronomers using the Atacama Large Millimeter/submillimeter Array (ALMA) have observed what may be the first-ever signs of windy weather around a T Tauri star, an infant analog of our own Sun. This may help explain why some T Tauri stars have disks that glow weirdly in infrared light while others shine in a more expected fashion. T Tauri stars are the infant versions of stars like our Sun. They are relatively normal, medium-size stars that are surrounded by the raw materials to build both rocky and gaseous planets. Though nearly invisible in optical light, these disks shine in both infrared and millimeter-wavelength light. "The material in the disk of a T Tauri star usually, but not always, emits infrared radiation with a predictable energy distribution," said Colette Salyk, an astronomer with the National Optical Astronomical Observatory (NOAO) in Tucson, Ariz., and lead author on a paper published in the Astrophysical Journal. "Some T Tauri stars, however, like to act up by emitting infrared radiation in unexpected ways." To account for the different infrared signature around such similar stars, astronomers propose that winds may be emanating from within some T Tauri stars' protoplanetary disks. These winds could have important implications for planet formation, potentially robbing the disk of some of the gas required for the formation of giant Jupiter-like planets, or stirring up the disk and causing the building blocks of planets to change location entirely. These winds have been predicted by astronomers, but have never been clearly detected. Using ALMA, Salyk and her colleagues looked for evidence of a possible wind in AS 205 N – a T Tauri star located 407 light-years away at the edge of a star-forming region in the constellation Ophiuchus, the Snake Bearer. This star seems to exhibit the strange infrared signature that has intrigued astronomers. With ALMA's exceptional resolution and sensitivity, the researchers were able to study the distribution of carbon monoxide around the star. 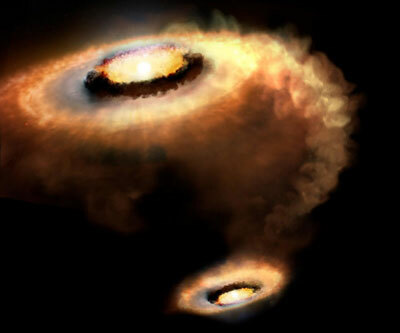 Carbon monoxide is an excellent tracer for the molecular gas that makes up stars and their planet-forming disks. These studies confirmed that there was indeed gas leaving the disk's surface, as would be expected if a wind were present. The properties of the wind, however, did not exactly match expectations. This difference between observations and expectations could be due to the fact that AS 205 N is actually part of a multiple star system – with a companion, dubbed AS 205 S, that is itself a binary star. This multiple star arrangement may suggest that the gas is leaving the disk's surface because it's being pulled away by the binary companion star rather than ejected by a wind. "We are hoping these new ALMA observations help us better understand winds, but they have also left us with a new mystery," said Salyk. "Are we seeing winds, or interactions with the companion star?" The study's authors are not pessimistic, however. They plan to continue their research with more ALMA observations, targeting other unusual T Tauri stars, with and without companions, to see whether they show these same features. T Tauri stars are named after their prototype star, discovered in 1852 – the third star in the constellation Taurus whose brightness was found to vary erratically. At one point, some 4.5 billion years ago, our Sun was a T Tauri star.